So, for all those that haven’t had a chance to follow the NANO (formerly known as RaiBlocks) saga, there apparently has been a new development in the fallout from the BitGrail hack. To backpedal for a second, on February 8, 2018, news of a massive hack of NANO tokens from the exchange, BitGrail, was “teased” to the general public via a tweet from their Twitter account. Whalepool was the first major crypto user/publication to break the news in the form of a formal write-up the following day on February 9, 2018. From that point, the situation began to devolve. The owner of the BitGrail exchange, Francesco ‘The Bomber’ Firano, was the individual whom was in contact with the NANO developers during the hack itself. Early reports that came out on February 8, 2018, from other Twitter users had alleged that Firano (owner of the BitGrail Exchange) was trying to negotiate with the NANO team to initiate a hard-fork to reverse the illicit transactions that were made from stealing money out of the exchange’s hot wallets. The NANO team refused to oblige to the exchange owner’s hard-fork request. This led to the ensuing standoff between the two parties in which each blamed the other’s negligence/competence for the loss of the NANO tokens. The first blow between NANO and Francesco was struck by ‘The Bomber’ when he put out a tweet on February 9, 2018, stating that the NANO team’s unwillingness to initiate a hard-fork was the reason why users were still deprived of the currency that they had stored on the exchange. The response by the NANO team came on that same day, February 9, 2018, via a Medium post that they published from their official account, which was titled, ‘Official Statement Regarding BitGrail’s Insolvency’. It’s worth noting that the title is worded in such a way as to give the impression that BitGrail’s insolvency prompted them to misappropriate the NANO tokens in order to solve their financial problems. The link to the alleged correspondence between XRB and Francisco can be accessed here. When all was said and done, approximately $150 million worth of NANO were stolen from the BitGrail hot wallets. Firano had announced at one point in time on Twitter that he would pursue legal action against the NANO team itself for defaming him, but has been eerily silent in the weeks since the incident. @nanocurrency We are pressing charges against you due to your irresponsible behavior. The BitGrail exchange was forced to shutter its doors shortly after the hack but posted a press release on March 14, 2017, where they announced a stable token, redeemable for the cash value of $1 per token would be released on their exchange to those that had lost NANO tokens. In this press release, the BitGrail exchange also reaffirms that they believe the hack to be a product of inherent defects in the NANO protocol and not due to any shortcomings on behalf of the BitGrail exchange. Despite the extended period of silence on this hack, the story is far from over. As noted earlier, over $150 million in user funds were lost on the exchange. So, a lot of people were significantly affected by the hack or whatever event took place that resulted in the loss of customer funds. It appears that there was already a discussion regarding filing a class action lawsuit against BitGrail on January 30th on NANO’s Reddit (approximately a week and a half before the hack itself). Rather than suing BitGrail, a class action lawsuit was brought by the “Silver Miller Law Firm” (named in the above Reddit comment), against the NANO team. We are working closely with @BitGrail on a node issue discovered due to the scale that BitGrail is processing transactions. 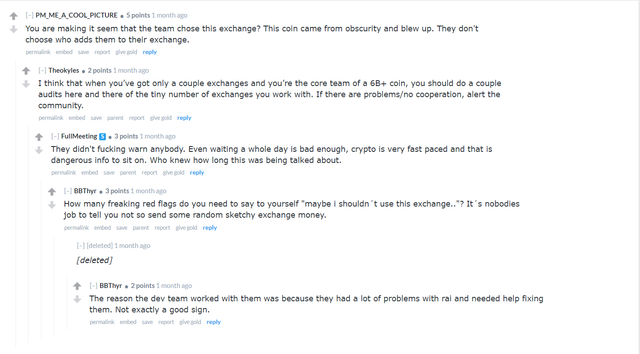 Unfortunately, this is not the case: Both in the joint Telegram group which hosted NANO team members and BitGrail executives as well as in various tweets such as the one below, the NANO team received more than enough information from Francesco and others to reasonably come to the conclusion that the exchange was highly susceptible to compromise/issues. Markets under maintenace in order to definitely fix the issue. There were plenty of indicators that things were not all on the “up and up” with BitGrail’s security/potential solvency, such as the tweet above, which was sent on December 30th, 2017, just 3 days before one of the NANO team members publicly stated that there were no problems with BitGrail’s exchange and that their funds would be 100% safe. This is also evidenced by the NANO community’s response shortly after the exchange hacking took place. This is reflected in user conversation on the Nano Reddit as well. Here is a link to the document (PDF) stating the details of the lawsuit as well as the allegations being made against the NANO team. 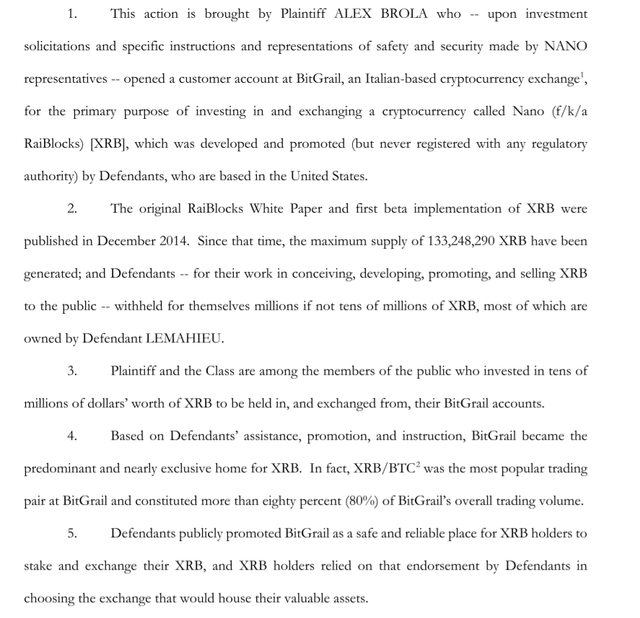 It’s also worth mentioning that the NANO team is based in the United States, as is the defendant of the lawsuit, so they will most definitely have to answer to this lawsuit. They will also be subject to scrutiny in accordance to the standards/regulations that have been set forth by the Securities and Exchanges Commission (SEC). This noted ambiguity in the amount of XRB that NANO owns hasn’t been touched on much in the crypto community with the exception of this Medium post, which raises some questions regarding the coin movement of XRB by NANO team members. So, it’s definitely interesting to see that this was included in the lawsuit. The lawsuit also makes the cogent argument that NANO did have the ability to rectify the situation through the use of a hard-fork, but refused – which is technically true. The lawsuit uses this fact to assert that, in not doing so, some of the onus of blame must be placed squarely upon NANO’s shoulders for the customers’ loss of funds – especially in light of the fact that the amount of funds that customers lost were probably exacerbated by the excessive trust that investors placed in NANO’s recommendation of BitGrail. The lawsuit also alleges that “XRB Are Investment Contract Securities that Were Never Registered or Exempted From Registration With Regulatory Authorities,” which is also true. This is a big deal and if the judge presiding over this case agrees with the plaintiff’s argument in this regard, then NANO’s fight to win could be insurmountable. To put it nicely, NANO may be in deep trouble. In an actual courtroom, it is possible that NANO will fit the billing as a “security,” according to the Howey Test. There are also numerous clear and unequivocal statements that the team made to investors where they reassured them that the exchange was safe and that they were in no risk despite there being a wealth of evidence to suggest otherwise. And finally, their refusal to initiate the hard-fork as Bomber had requested may come back to bite them as well. Sure, there are philosophical reasons for not wanting to initiate a hard-fork, such as preserving the immutability of the blockchain, but the courts will more than likely not take this into consideration or consider this to be a legitimate excuse during their review of the case. The courts will merely examine whether there is something that XRB/NANO could have done to help users recoup their stolen funds and it’s hard, if not impossible, to argue that a hard-fork wouldn’t have rectified this situation. Would it have hurt NANO’s reputation and potentially caused strife in the community? Sure. But would it have returned the users’ assets to them? Definitely. And the latter is the only question that the courts are mainly concerned with in torts of this nature. So, when looking at everything in its totality, NANO may be in some serious trouble.